Mandalas are a spiritual, holistic form of art. Mandala Magic is where meditation and intuitive art merge into one wonderful process. 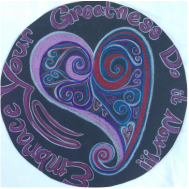 Creating a mandala drawing enables you to have a sacred circle to contain your essence and intention at that time. Intentions can include discovering a healing symbol or a different perspective to a challenge you are facing. Decode the symbolic language of your unconscious mind. Uncover hidden motives and desires. Discover your ability to move through challenge with grace and ease. Invite joy and clarity into your life. The word mandala is sanscrit in origin and means “container of essence” or “sacred circle”. There are modern and ancient forms of this art process. There are different kinds of mandalas. Many indigenous cultures. use mandalas for making symbolic offerings to the universe. The medicine wheel in Native American Indian culture is used in many traditions from dancing to ceremonial art. In Christianity the rose window and Celtic Cross have links to the mandala and sacred geometry. The patterns used in a mandala design are specific to the ritual or lesson that is being practiced. Mandalas are executed in a state rapture. Circles are the most profound shape. Nothing fancy - one simple curve that comes together. All points are equidistant from the center but mathematicians struggle to perfectly square it. No matter what size a circle is the ratio of circumference to it's diameter is Pi - a number that refuses to be rational. The circle is a perfect symbol of the divine feminine - powerful, balanced and ready to receive. Atoms, cells, seeds, planets, and globular star systems all echo the spherical paradigm of total inclusion, acceptance, simultaneous potential and fruition, the macrocosm and microcosm. Creating a mandala starts with a circle. This circle becomes a sacred space for the soul to create an expression. In Mandala Magic workshops we explore the mandala through meditations designed to connect to the divine source of all that is, blessing the materials to be used and go within. Creating mandalas allows you to practice non-judgment and to trust yourself as you are led subconsciously to which color to use, where to draw lines and what images surface. Participants are encouraged to reflect on the symbolism of what they have created and how this information can be integrated into their daily life. We will use this opportunity to fill our circle with intention and divine guidance. When you move deeper into the unfolding process of a mandala you enter this moment. You awaken to the formless essence of who you are – the luminous self.